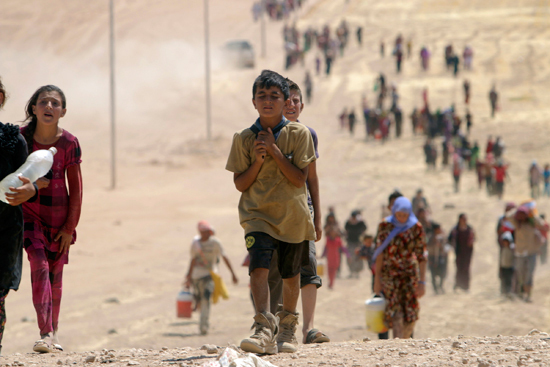 Yet another pitiful sight from the Middle East: tens of thousands of desperate Iraqi Yazidis and 200,000 Christians fleeing their homes near Mosul and seeking refuge in the mountains of nearby Kurdistan. President Barack Obama has acknowledged that the world is witnessing “a potential act of genocide”. Many more such wretched scenes of religious cleansing will assault our eyes and touch our hearts as the disintegration of the post-World War II order in the Middle East gains pace. Since 2007 I have travelled extensively in Iraq and Syria on many humanitarian aid missions, and have witnessed the grisly progress of Sunni jihad, culminating in the latest Islamic State (IS) offensive against the city of Mosul and outlying towns and villages in Nineveh Province. This process, which has led to the establishment of a borderless caliphate based in Iraq and Syria, has predictably led to the religious cleansing of non-Sunnis, including Christians, Shiites, Alawites and Yazidi. Non-submissive Sunnis are also persecuted. If this process is left unchecked, we will soon find the Bible lands of the Middle East, with the exception of Israel, devoid of Bible people. The last of the non-Israeli Jewish communities were eradicated in the 1960s. Now it is the turn of the Christians. The simple saying, “Sunday follows Saturday”, is often cited in the Middle East when speaking of the region’s disappearing Christian population. The "Saturday" people have gone; next, the "Sunday" people. The genocidal jihad that is now gaining momentum is fuelled mainly by powerful figures in Saudi Arabia, Qatar, and Kuwait – all Sunni regional allies of Washington, London and Paris. Since the 1980s, a bigoted ideology of Sunni supremacism has been massively exported by oil-rich states and non-state actors. The radicalisation of the region and the growth of jihadi terror groups are among the results. This phenomenon would not have been possible without the backing of Washington and its allies. Radical Islam was viewed as a useful barrier to the expansion of communism. Jihadists were used by the Western powers to spearhead the onslaught against Soviet forces in Afghanistan. The same tactics are used now in Syria to overthrow the Assad regime, an ally of Iran and Russia. Turkey, a NATO member and candidate for membership of the EU, has been an important sanctuary, gateway and facilitator of jihadi rebels in Syria. The empowerment of Al Qa’eda was the consequence of this misguided policy in Afghanistan. The phenomenal expansion of IS arises from its application in Syria. Humanitarian aid is desperately needed. But aid actions will not address the root cause of the upsurge of genocidal jihadism. Washington and its allies can most effectively engage in genocide prevention by reining in the financial and ideological support for jihadism emanating from allies in the region, using punitive measures, such as sanctions and a denial of military support, if necessary. Western powers can also make a major contribution to a restoration of stability in the region by refraining from poorly thought through regime change policies, and by taking initiatives to cooperate with Russia and China for the provision of collective security. This is a tall order and will require major and painful strategic changes. Church leaders have an obligation to rally the faithful to provide humanitarian aid, and to echo loud and clear the many pleas of Pope Francis and his predecessor for solidarity with the existentially threatened church in the Middle East.